Wolverines are scarce across their circumpolar range. Locally, populations are classified from secure to endangered or even extirpated. Globally, they are listed as vulnerable. Although they resemble small bears, wolverines actually belong to the weasel family. These solitary animals primarily live in the remote reaches of northern boreal forests, in the sub-Arctic tundra of northern Canada, on the alpine and Arctic tundras of Alaska and the Northern Hemisphere, in the Nordic countries of Europe, and throughout western Russia and Siberia. Wolverines need to be on the move: Some travel 15 miles per day in search of food. This means that wildlife corridors are important for their survival; a commodity that is becoming more and more scarce. They also depend on snowpack—another wolverine necessity that is rapidly dwindling. 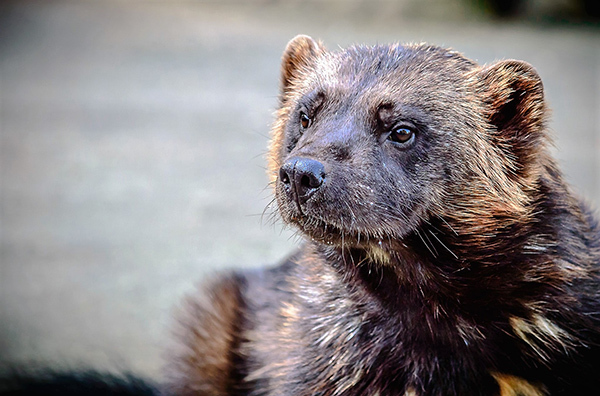 Watch this video from The Wolverine Foundation on these powerful, secretive animals. Just like us, it seems, they need to know that there are still large tracts of wild places “out there”; that there is still room to roam. Now that I’m looking for the weasel, I feel as if I’ve been fooled for years. Believe it or not, I spotted a wolverine on a golf course outside of Ann Arbor, Michigan about 2 years ago. We were getting set up for our fairway shots and I saw a movement out of my right eye. I turned slightly to my right and watched a wolverine glide along the ground into the forest lining the fairway. I almost broke into a happy dance. Incredible creatures….. This is a great little video to watch about wolverines. I live and work in Mongolia on PA Management and this past year came across what I thought were unusual tracks in the snow. I found that they looked like wolverine tracks, but was unsure and didn’t really believe it. I then asked some local herders who live in the area about them and they too had seen the tracks and immediately said it’s the “bauvga duu”, or the bear’s little brother. Bauvga is bear and duu is younger sibling in Mongolian. I was surprised to find these tracks so close to an urban area. Yet, the forest is still connected to the largest roadless area left in the country. The film states that our human activities impacts wildlife and especially wolverines in ways we don’t even know about or see and particularly along the fringes of their habitat. This winter wolverine tracks have not been seen and probably due to increased use of the forest for pine nut collecting, something that has taken place this year like never before with hundreds of people being paid to collect these for commercial sale. I’d like to see the bear’s little brother or his tracks again and have set up remote night/day camera’s in the area where previous tracks were seen. A distant possibility, but worth a try to just get a glimpse of these amazing animals. I’ve never seen a Wolverine, but I encountered a Fisher last spring while photographing wildflowers. It is in the weasel family as well and, I read, shares some of the habits of its larger northern cousin. It looks like an otter on steroids. We were both quite startled. Wild life corridors are a simple idea in theory but (to my knowledge) it seems that implementing them is another matter. Given their Arctic habitat are their home ranges commonly disturbed? I love wolverines. I think that they are fascinating animals. I have watched many documentaries about them, and they are great and caring parents for their little ones, and also efficient hunters. They are not cruel or vicious as commonly thought.